Whilst doing my shopping yesterday, I was looking for a particular gift. I won’t say what just in case the recipient is reading this… But buying the British Heart Foundation version of this item meant a donation was made to support the charity and I got what I was looking for too. I’m really feeling the over-commercialised nature of Christmas this year, but this way I’m giving a gift that gives a little bit more and helps to do something that really matters. I’ve been thinking about my environmental impact a lot this Christmas and whilst I know there are a lot of things I could still improve, I’ve definitely taken the first step to meaningful and long term change. Posted by cathie2014 in Charity, Making life better! While I was shopping today I bought a couple of things I thought were 2 for £1 only to discover they’d been reduced and it was now BOGOF. I already had a £1 coin in my hand, so it was easy to pop the change straight in to the collection box on the counter. My change went to support St. Michael’s Hospice (North Hampshire) http://www.stmichaelshospice.org.uk/. The hospice enables people faced with a life limiting illness, their families and carers, to attain the highest possible quality of life by providing a choice of specialist care and support. I’ve petitioned George Osborne asking him not to cut funds for councils to provide emergency assistance to people hit by crisis. If someone has fled domestic violence, or been hit by a fire or a flood, the government should help them get back on their feet. It’s wrong to force victims of misfortune to rely on charity, food banks or loan sharks. Use the link below to add your signature to the petition. 352.We visited Winchester’s Christmas Markets and then went to the Chesil Rectory, for dinner. The Chesil Rectory are taking part in Streetsmart. A pretty straightforward idea: participating restaurants add a voluntary £1 donation to your bill. 100% of this money goes to local homeless charities. This campaign runs during November and December. Last year they raised £610,000. That’s what we did yesterday. The charity gives abandoned and homeless pets a second chance of happiness. 349. Why is giving blood or platelets so important? Every time you give blood you can help save or improve the lives of up to 3 people. Hospitals in England & North Wales need over 6100 blood donations and 330 platelet donations for patients every day. I’ve created an e-card and shared it on facebook to help remind people of the need for blood. At the weekend I went out for a meal and as I scanned the menu I noticed that some of the dishes included a donation to charity when you ordered them – checking for this is now becoming a habit. Five Papuan teenagers have been shot dead by the security forces during a protest. 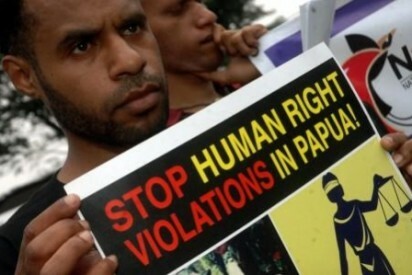 For decades West Papua’s tribal people have been killed, raped, arrested and tortured by Indonesian soldiers and police. The government in Jakarta has done nothing to stop them. There are 65 West Papuan political prisoners behind bars, many are incarcerated merely for raising the West Papuan flag or for peacefully calling for independence. These ‘offences’ can result in 15 years in prison. Indonesia’s new President has promised to enter into dialogue with the Papuan people and to move away from a military solution to the region’s problems. His response to the teenager’s deaths will be a test of this resolve. I’ve e-mailed President Widodo, urging him investigate the shooting of the five teenagers and to ensure that the killers are brought to justice. I’ve also asked for an end to human rights violations in the region and asked him to enter into dialogue with the Papuan people to resolve the problems. It’s not news to me that there is extreme inequality in the world between those who have and those who have not. We can even things up if we all demand that governments across the world make the right economic and political decisions. We can change the rules on tax to make sure the richest pay their fair share. We can demand more spending on public health and education to give poor people a fighting chance. We can demand fair wages for everyone. We can make sure the poorest people have a voice, and that it is heard by those in power. I’ve signed up. Will you?